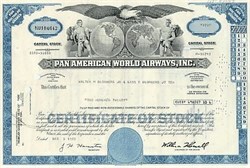 Pack of 100 certificates from Pan American World Airways circa 1970s - Price includes Shipping cost in U.S.
Home > Certificate Quantities for Educators / Business Promotions > Pack of 100 certificates from Pan American World Airways circa 1970s - Price includes Shipping cost in U.S.
Home > Aviation > Scripophily - Pan American World Airways Stock Certificate > Pack of 100 certificates from Pan American World Airways circa 1970s - Price includes Shipping cost in U.S.
Home > Discount Packages > Miscellaneous Packages > Pack of 100 certificates from Pan American World Airways circa 1970s - Price includes Shipping cost in U.S.
Beautiful engraved stock certificate in mint condition from the now defunct (again) Pan American World Airways issued prior to 1981. The vignette shows 2 partially clothed men holding the two globes topped by an eagle. Mixture of red and blue certificates.